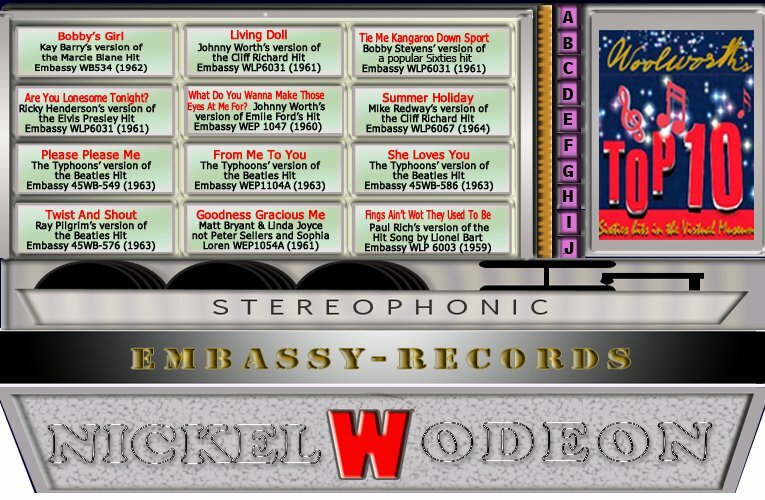 Embassy Records were one of the most controversial ranges ever stocked at Woolworth's. Some customers loved them, while many hated them. The High Street stores commissioned Oriole Records to make cover versions of songs destined for the Hit Parade before they were even released, so that Woolies could put the discs on sale at a much lower price when the hit first appeared on the shelves of rival stores. The recording quality was tip-top, with many of the cover artists giving the stars a good run for their money. But many a teenager was less than pleased with the gift that granny had bought them!. This jukebox offers a selection of the records for you to sample. It's part of our cover story feature.